There seems to be two strategies for shooting cross country day at events like Burghley. One - Find a spot and take every rider over the same fence or fences. Two - Move around the course during the day. Personally, I favour the second option. However you do need to have a bit of a plan to know where you are going next, where the light is going to be and who in the field you MUST get and who you are prepared to miss to get to the next location. Add a few thousand public in the mix and a large number of other photographers and the thing starts to get a wee bit complicated. It does get easier if you do the same event every season as you start to know the locations and things that did or didn’t work out can be stored in the memory banks for subsequent years. 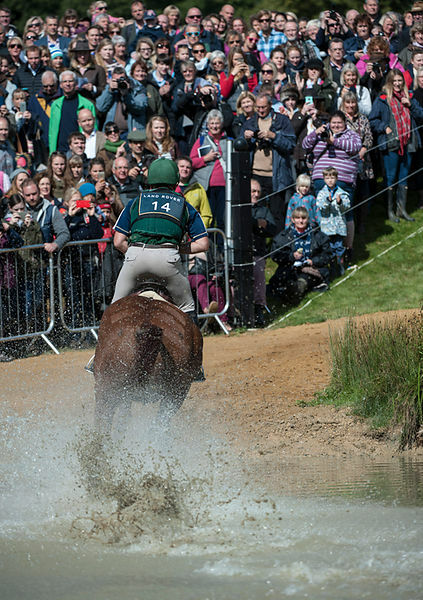 This year with the Burghley running the other way around for the first time in years presented some new options. After walking the course in sections after the dressage sessions had finished my plan for Saturday was as follows. The East side of Lion Bridge for about the first 10-15 riders, by which time the sun [if there was any] would have swung round behind the bridge. The Leaf Pit via a short stop in the arena for the the Up and Under Rugby World Cup fences and then Discovery Valley. Then finally up to the start / finish for the last riders, hopefully getting the house in the background. Things started really well, the cloud started to break up to show patches of blue sky as cross country started and I did get some good remote shots of the drop into the water at the Lion Bridge. Michael Jung (GER) riding Fischerrocana FST [World #1 and Leader after dressage] took an early bath right in front of me - unfortunately the camera’s auto focus locked on to the water rather than the rider and produced a number of very out of focus images of a most spectacular crash. A couple of reasonable shots in the Arena and Discovery Valley of riders were caught on the way through. The Leaf Pit which is such an iconic part of Burghley was not good for me and I remembered why I hadn’t been there since my first Burghley - did I mention experiences stored in memory!!! The start and finish was good move as it is close to the press office and I have never been at these fences before and would do again. So all in all not a bad day, but very, very tired at the end of it, did the press conference, edited and wired and crashed. Picture : Austin O'Connor (IRL) riding Morning Venture leave the water at the Lion Bridge.